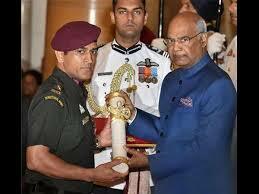 Mahendra Singh Dhoni was in his army uniform when he received the Padma Bhushan from President Ram Nath Kovind. Former India captain Mahendra Singh Dhoni was presented with the Padma Bhushan, country's third highest civilian award, by President Ram Nath Kovind on Monday evening. Dhoni, who holds the rank of Honorary Lieutenant Colonel in the Territorial Army, wore his uniform for the gala ceremony. On Tuesday, Dhoni took to Instagram and thanked the armed forces for their exemplary services to the country and said that accepting the honour in his army uniform "increased the excitement tenfold". The 36-year-old's Instagram post was an instant hit, garnering over 450,000 likes and close to 11,000 comments at the time of writing this article. "An honour to get the Padma Bhushan and receiving it in Uniform increases the excitement ten folds.thanks to all the Men and Women in Uniform and their families for the Sacrifices they make so that all of us could enjoy our Constitutional Rights.Jai Hind," Dhoni wrote on his Instagram post. 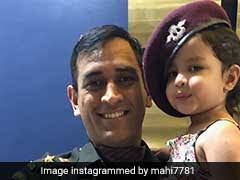 The post also had multiple pictures tagged in it but one stood out -- that of Dhoni, wearing his uniform, holding his daughter while she wears his army cap. Incidentally, Dhoni was conferred with the prestigious civilian honour on the seventh anniversary of India's famous 2011 ICC World Cup triumph. Dhoni was the player to secure India the coveted title when he hit a massive six over long-on at the Wankhede Stadium in Mumbai. Apart from Dhoni, multiple billiards world champion Pankaj Advani also received the award for his extra ordinary achievements. Advani, 32, has ruled world billiards for several years. The Bengaluru-based cueist has won 18 world titles. 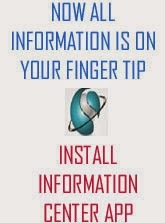 Advani had claimed the IBSF World Snooker Championship title in November last year. Just like Dhoni, Advani also has a distinguished career, having won two Asian Games gold medals, in 2006 Doha and 2010 Guangzhou.